Make the most of smoked mackerel and herring with the recipes below. 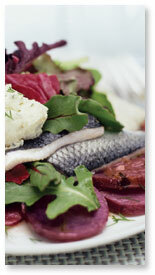 Both fish offer great nutritional benefits and tasty flavors to add to your recipe repertoire. A colorful herring salad from Chef Ludger Szmania with multiple flavors in a sour-cream dressing, served over mesclun, adapted from a dish served at SZMANIA’s. Apples, onions, lemon and cream cheese expand and complement the flavor of canned herrings in this appetizer or light lunch entree garnished with dill. A traditional recipe from the Hanseatic cities for fresh herring breaded, fried and then marinated with pickles, onions, chilies and spices. The flavor of marinated matjes herring is complemented by German dill pickles, and a smooth, creamy taste of mayonnaise and vanilla yogurt. A fillet of herring rolled and stuffed with julienne carrot and onions and a sauce of vinegar, wine, carrot slices, peppercorns, bay leaf, juniper berries, and thyme.